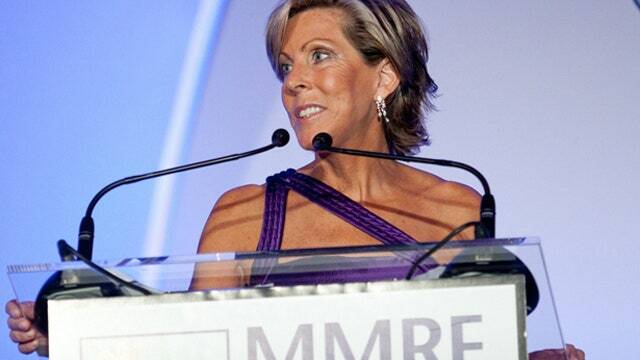 When Kathy Giusti was diagnosed with a rare, 100% fatal blood cancer, the Multiple Myeloma Research Foundation CEO wasn’t going to waste the three years she had left to live, instead she launched an effort to put drugs in the pipeline to fight for a cure. At 37 years old, Kathy Giusti was handed what amounted to a death sentence when she was diagnosed with multiple myeloma: A rare, fatal blood cancer. Her doctors told her she had only three years to live, and with no treatments available, and not a single drug in the pipeline, they told her to prepare for the last years of her life. After digesting the shock and sadness of her diagnosis, Giusti decided she wasn’t going to let myeloma get the best of her, and she settled in for the fight of her life. “Having a one-year old daughter at home – when I wanted to pull the covers over my head, I would hear the pitter patter of little feet, and I would think to myself, ‘No. No, I’m not going to do that. I’m going to fight to live as long as I can and see as many moments as I can with her,’” Giusti said. She started the Multiple Myeloma Research Foundation in 1998 as a way to give herself – and others fighting the same fight – a glimmer of hope. Armed with a business degree from Harvard, a high-powered career in the pharmaceutical industry and a background in medicine, she set out to find some kind of treatment that would give her more time for her daughter – at least long enough that her daughter would remember her mother. “My dream was to jump-start enough research so that good things would happen to keep me living long enough to allow Nichole to remember me. When I started, it was a little bit selfish, but once I started it, I kept living and seeing the next challenge,” she said. Giusti attributes the foundation’s success to her disease. She said being a cancer patient ignites a bigger spark to drive research and drug development. “What happens when you are a patient running an organization like this, and you talk to other patients every day who have relapsed and run out of options, you have tremendous urgency to help save their lives,” she said. After receiving her diagnosis and vowing to do something to help those suffering with the same prognosis, Giusti faced one of her biggest challenges: Getting her foundation off the ground. To do it, she tapped into her Harvard Business School connections, and her years of experience in the private sector, working for companies like Merck (NYSE:MRK), Gillette, and G.D. Searle & Co. She worked with a team at Harvard to write a business plan for the foundation that focused on how she wanted to move into the world of research and drug development – a unique idea in 1998 when many foundations focused instead on patient advocacy, lobbying, and support groups. But moving into that realm of the non-profit world wasn’t easy. She said it’s a matter of identifying roles for all parties involved, from the doctors, patients and scientists, to the pharmaceutical companies and the Food and Drug Administration. But it’s not all just a matter of writing a compelling business plan and gathering a team of experts. Giusti said money is still what matters. MMRF has raised more than $225 million dollars and with it, created six FDA-approved drugs to fight multiple myeloma, with 25 more in the pipeline. Not only that, but the prognosis isn’t quite as grim for those diagnosed with the cancer thanks to recent medical advances. Patients are now given up to eight years to live instead of just three, and have the opportunity to fight with the drugs MMRF has helped create. Though she’s managed to defy the odds for nearly two decades, Giusti knows myeloma will one day become too much for her to fight. Despite her fate, she stays optimistic about her future, her family’s future, and the future of the MMRF. In the short-term, Giusti said she believes it’s going to be the high quality data – live tissue banks, blood banks, electronic medical records, and data from myeloma patients – that will be the key to accelerating a cure. “This whole field of where we’re pushing: Big data, open access, intellectual property rights, that was my dream and I really wanted to launch it and it needs a champion – a patient – saying it was no one’s fault but (instead caused by) not sharing data. The system is insanely broken, and it’s stifling the ability to find cures quickly,” she said. The technology, she said, is now working in favor of a cure. And she said she’s proud MMRF is leading that charge. In the long-term, whether she’s there to lead her foundation or not, Giusti said her ultimate goal is to find a cure for multiple myeloma and facilitate a transfer of knowledge. For others who are fighting the same fight, Giusti said you don’t have to have a background in business and medicine to help eliminate the disease. She suggests finding a foundation to work with to help aid in the research and development processes – but that doesn’t mean you have to lead from the top. “I think doing something (about the disease) makes you feel so much more empowered as a patient and gives you a lot more energy to fight your disease. Knowledge is power in understanding new therapies and treatments for your disease. People like to be in denial, but the more you learn, the better off you’ll be,” she said.